While the leading and retiring sax phrases may make for glances towards the back mirror, the song as is after the 2min mark is worth the slow build. The title refers to a small beach town in Southern Brazil. The repeated saxophone/bass backgrounds roll in like waves, and alto saxophonist Rick Stone floats over it all. 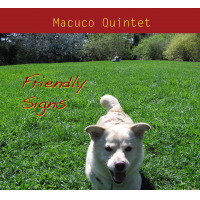 Our album Friendly Signs is mainly a mix of Brazilian and jazz influences with a somewhat unusual instrumentation: three saxophones, electric bass, and drums. Ten original compositions by Joel Springer and one by Julius Hemphill. Hope you like it! Macucos; Itajuba; Friendly Signs; Modernismo; More Serious; Os Gêmeos; Postcard to Carla; Sun & Clouds; Leaping Over a Black Pool; Johannzinho; Touchic' (by Julius Hemphill). Allan Chase: soprano, alto, baritone saxophones; Rick Stone: alto saxophone (right channel); Joel Springer: tenor, sopranino saxophones; Fernando Huergo: bass; Austin McMahon: drums, percussion.